Donald Ahlgren, 28, thought he would find a safe haven in a sober home, but eventually asked to be returned to prison, where he has found more support. Two years ago, Donald Ahlgren faced a dilemma common among the legions of drug addicts just out of detoxification programs: He needed an affordable place to live that wouldn’t reject him because of his past. To his surprise, he had his pick of places. These low-budget rooms were typically in apartment buildings or houses, and tucked in some of the most recession-plagued neighborhoods of Boston and nearby suburbs. Landlords advertised them as “sober homes,’’ an informal term used for rentals marketed to recovering substance abusers. Residents are warned about mandatory urine testing — typically three times a week — and zero-tolerance rules, but also promised a supportive you-can-do-it environment. 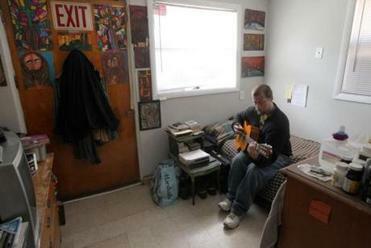 Ron Carlino Jr. at a sober house run by Twelve Step Education Program of New England, which Donald Ahlgren’s mother said was one of the few good programs. 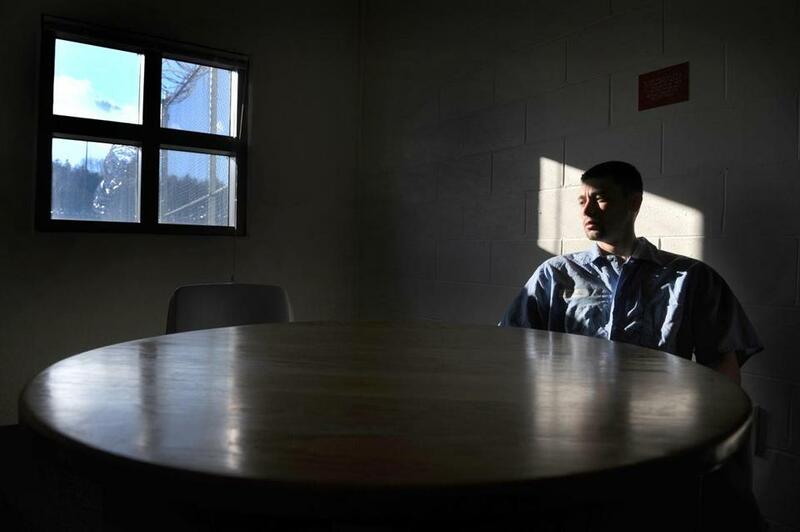 “For a time, I was wanted,’’ recalled Ahlgren, 28, a North Reading native who had spent years in and out of drug rehabilitation programs and the courts. Yet he quickly realized that many of these places did not seem to care much about preventing relapses. For all the attention to urine testing, Ahlgren said, he and other tenants sometimes got high on the side and then found, to their surprise and relief, that landlords did not evict them after “dirty’’ results. Ahlgren soon discovered the dark side of this little-known niche of the drug world: Recovering addicts were cash cows for a financial alliance between sober homes and private drug-testing labs. Landlords needed the labs to show they were serious about sobriety, largely to get referrals to fill their rooms. And the labs needed access to lots of indigent substance abusers whose drug-screening tests qualified for lucrative Medicaid reimbursements worth millions of dollars a year. These business relationships troubled Ahlgren and also drew the scrutiny of prosecutors, who now allege that a number of labs and sober homes engaged in fraud and abuse of Medicaid, the government’s health insurance program for the poor. On Friday, one major lab agreed to pay $20 million to settle state charges that it improperly billed for testing in sober homes. Prosecutors have said that, as labs aggressively competed to sign up addicts for testing some resorted to bribing sober home operators for exclusive access to their tenants. Several lab executives — including a Brookline doctor who treated Ahlgren — have also been indicted in schemes that, among other things, required addicts to undergo excessive urine testing — much more frequent than is typically recommended by substance abuse specialists. The crackdown came too late for many struggling addicts like Ahlgren, who succumbed again to the grip of narcotics. He would eventually get clean, though only after going to extremes: He almost begged to be put behind bars again to escape from a world where all that anyone seemed to care about was his Medicaid card. After being released from a detoxification program in the summer of 2010, Ahlgren told his mother he was ready to change. He wanted to stop his OxyContin and heroin cravings, which had begun when he was in high school and had driven him to burglarize houses to pay for the drugs. Though skeptical at first, Anne Marie Hallahan, a day-care teacher, knew her son had worked hard to get sober and she began seeing a sparkle in his eyes that reminded her of his happier days as an award-winning black-belt karate competitor. He expressed an interest in sober homes, realizing that it wasn’t best for him to live any more with family and friends. When Ahlgren’s mother agreed to subsidize the rent — about $150 a week for a shared room — Ahlgren told her that she would not regret it. He promised he would eventually find work and become independent. “I want you to be proud of me,’’ he said. A drug treatment counselor recommended a sober home called New Horizon House. The house, in a residential section of Quincy, was part of a scattered complex of a half-dozen properties in Boston and Quincy, which Carl Smith, the 66-year-old landlord, had converted into sober homes for some 90 recovering substance abusers. Sober homes are similar to halfway houses, providing shared bedroom space and communal living areas — and occasionally meals — for a weekly fee. Their numbers grew over the past decade as landlords found this specialized corner of the rental market profitable. But the homes are unregulated, and, other than ensuring that their properties meet building safety codes, landlords do not have to provide any special services or enforce any rules. Still, most require urine testing, which is typically paid for by insurance. For instance, Medicaid pays about $100 to $200 for each urine screen, as long as a doctor signs a form saying the test is medically necessary. Ahlgren learned that New Horizon’s testing rules were ironclad: All tenants had to use Dr. Punyamurtula Kishore of Brookline as their primary care doctor, or one of his associates, and submit three urine samples each week, at scheduled times, to Kishore’s lab and clinic operation, Preventive Medicine Associates. 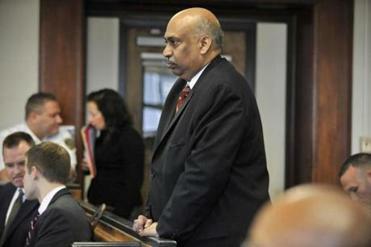 Dr. Punyamurtula Kishore during his arraignment on charges that he operated a kickback scheme and fraudulently billed the state for nearly $3.8 million. This regimen differed from what many top addiction specialists, including John F. Kelly of the Center for Addiction Medicine at Massachusetts General Hospital, recommend for most recovering addicts in such settings, which is random testing — not scheduled — once every week or two. Kishore’s business had enjoyed stunning growth — he had about 30 offices throughout the state, employing about 370 people, including some 30 physicians. By 2010, Preventive Medicine enjoyed $4.9 million in annual Medicaid payments for urine screening. Kishore’s business began to thrive soon after Attorney General Martha Coakley’s office launched criminal investigations of his competition. Willow Labs of Lynn had agreed in 2007 to a $8 million settlement for submitting Medicaid claims without proper medical approval. And in 2010, state prosecutors indicted Calloway Labs of Woburn and two executives for allegedly delivering bribes to sober home operators through sham companies and using fake doctors’ signatures on Medicaid claims. Calloway settled for $20 million this past week, while the executives, who have pleaded not guilty, await trial later this year. With much of his competition tainted, Kishore, 61, made sales pitches to sober homes emphasizing that he was a medical doctor and employed other doctors, who could properly authorize drug tests. The physician began attracting more business, including from some sober-home managers who saw him as a dedicated doctor, one of the few willing to focus on substance abusers. Ahlgren would have one face-to-face meeting with Kishore. As a condition of staying at New Horizon, he had to attend relapse-prevention group sessions in Kishore’s Quincy clinic. During one, Ahlgren listened to a large, avuncular-looking doctor who spoke about the daily struggles against temptation. Kishore talked about resisting the thrill-seeking life, which increasingly tempted Ahlgren as he saw so many people around him using drugs and drinking. He had begun to smoke marijuana from time to time. After a month or so at New Horizon, Ahlgren decided to try a new place. Tenants moved easily among sober homes because their rent was paid weekly and the landlords were always interested in attracting new tenants. Ahlgren went to live in a cluster of a half-dozen town houses in the Fort Hill section of Roxbury, where he met a tall, charismatic former drug addict named David Perry. Perry sees himself on a public service mission to provide housing to an overlooked population, though his reputation in Roxbury suffered when he — along with a partner, David Fromm — ran a large sober-house operation, called Safe Haven, that shut down amid neighborhood outcry in 2007 over unruly and overcrowded conditions, as well as tenants’ drug and alcohol abuse. Perry later started his own sober-home business, Recovery Educational Services, and when Ahlgren moved in, he found a familiar urine-screening routine: He had to submit three specimens a week, at scheduled times. They were sent to Precision Testing Laboratories — Fromm’s new venture. Soon, Ahlgren got pulled into a bitter feud between Precision and Kishore’s labs, which had stolen away a number of sober-home clients from Fromm’s business, including New Horizon. Precision suspected something shady, perhaps kickbacks, and the company asked Ahlgren in the fall of 2010 to submit an affidavit for a lawsuit they were preparing. Ahlgren ended up becoming a bit player in the effort to take down Kishore, testifying in his sworn statement that, at New Horizon, he and other tenants were required to use Kishore’s clinics for medical referrals and urine tests. Ahlgren felt he had to submit the affidavit. He had become friendly with Perry, joining him occasionally to speak before recovering addicts’ groups. By now Ahlgren was struggling badly, taking OxyContin, heroin, and anything else he could get his hands on. He said he appreciated how Perry gave him a break, more than once, when Ahlgren’s urine screens turned out badly and he vowed to change. Prosecutors would find even more. In Kishore’s records, they turned up checks to numerous sober home operators; prosecutors viewed them as bribes, though the payments were veiled as salaries for no-show jobs or fees for alleged rental of beds or space in sober homes. Some checks were drawn from an account in the name of a nonprofit institution that Kishore had created as an educational resource for drug treatment specialists, the National Library of Addictions. Kishore was indicted last fall, charged with fraudulently billing Medicaid nearly $4 million for tens of thousands of urine screens that allegedly induced through bribery. The indictment against Kishore and his business also named eight sober home operations that allegedly accepted Kishore’s bribes in return for exclusive access to their tenants. In all, the case involved more than 860 Medicaid recipients and more than 53,000 claims. Kishore and Preventive Medicine Associates pleaded not guilty and defended the payments to sober homes as legitimate business expenses. Smith also pleaded not guilty. The alleged corruption involving sober homes and labs has led state health authorities to look into regulating these homes, and while no specifics have been released, they are expected to issue a report later this year. Meanwhile, Medicaid is now forcing labs to give detailed medical justification for urine tests involving sober house tenants, prompting Precision Labs to complain that this population is being singled out. Substance abuse counselors, however, say they welcome the state’s scrutiny. Some sober homes provide a supportive transitional environment for recovering addicts, they say, but others simply pursue profits, and their loose environment often tempt addicts to resume their habits. “They’re really just boarding houses, and as long as you pay rent, they don’t care,’’ said Nicholas Tenaglia, program director of the Men’s Addiction Treatment Center in Brockton. One morning in December, as a Globe reporter made an unannounced visit to Kishore’s Brookline offices, the physician appeared in the hallway. He was dressed in a suit coat and formal slacks, which concealed the GPS ankle bracelet he was required to wear as a condition of bail. Kishore spoke amiably about his “public health mission’’ to help desperate substance abusers, a population many doctors avoid because recovery is so often difficult, prolonged, and full of setbacks. He said he regrets that his patients had been forced to scatter in search of new clinics when he shut down his operation after Medicaid stopped paying him. Kishore looked wistfully down the hallway, with doors leading to now-empty offices. “We were a pretty big enterprise at one time,’’ he said, then politely cut short the conversation. He has declined requests for further interviews. Meanwhile, Ahlgren’s mother watched helplessly as her son’s life spiraled out of control. She spoke highly of one of the last sober homes where her son stayed, Twelve Step Education Program of New England, in Woburn. But other than that, she felt the money she spent for this kind of housing was wasted. “These sober homes turned out to be just dumping grounds,’’ she said. She was convinced that her son needed long-term hospitalization. She said Medicaid declined to cover an extended stay, and he did not know where to turn. Ahlgren, gaunt and pale, worried that he would steal again to feed his habit. Late last summer, he called a probation officer assigned to him from an out-of-state burglary conviction: Take me in, please, he pleaded, before I do something. Now in a state prison in Warren, Maine, Ahlgren said he got sober by going cold turkey in the structured environment behind bars. He said asking to be incarcerated was one of his best decisions.